"911 in the Philippines really does freakin work!!!! I am amazed!" posted a netizen whose family got rescued after their car broke down amid heavy downpour. 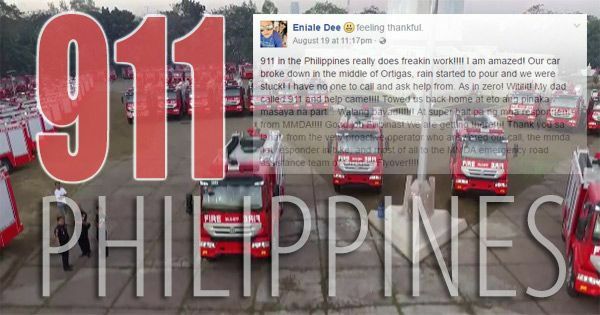 Facebook user Eniale Dee, who felt thankful, praised the 911 operators and responders coming from the Metropolitan Manila Development Authority (MMDA) who towed their vehicle home. "911 in the Philippines really does freakin work!!!! I am amazed! Our car broke down in the middle of Ortigas, rain started to pour and we were stuck! I have no one to call and ask help from. As in zero! Wititit! My dad called 911 and help came!!!! Towed us back home at eto ang pinaka masaya na part... Walang bayad!!!!!! At super bait pa ng mga respondents from MMDA!!!! Good job Pilipinas! We are getting there!!!! Thank you sa lahat, from the very proactive operator who answered our call, the mmda 1st responder in bike, and most of all to the MMDA emergency road assistance team of Ortigas Flyover!" Launched on August 1, 2016 upon the order of President Rodrigo Duterte, 911 is the national emergency telephone number for the Philippines which is officially known as Emergency Network Philippines (ENP). 911 Philippines is available nationwide 24/7. For now, all calls received through the hotline will be rerouted to the existing Patrol 117 hotline while the 911 Central Command Center is not yet established. Existing call centers are located in Laoag City (Region 1), Tuguegarao City (Region 2), Balanga City, Bataan (Region 3), Batangas City (Region 4-A), Puerto Princesa City (Region 4-B), Legazpi City (Region 5), Iloilo City (Region 6), Cebu City (Region 7), Tacloban City (Region 8), Zamboanga City (Region 9), Malaybalay City (Region 10), Davao City (Region 11), Koronadal City (Region 12), Butuan City (Region 13), Baguio City (CAR), and Quezon City in the NCR. Dee's friends lauded President Duterte for implementing Davao's 911 on a nationwide scale. Netizen Gie Shock said, "We can really feel the so called CHANGE!!!"